Tested for durability in conditions exceeding all KCMA certification requirements and BHMS standards for cycle life, strength and finish quality. Reliable, self-closing power of dual compression springs. Use (2) #6 O.H. x 5/8" type and (3) #6 F.H. x 1/2" type screws. 2.75"L x 1.875"W x .625"H. 3/8" inset. Use with five #6 O.H. x 5/8" type screws. 2-3/4"L x 2"W x 1/8"H. 3/8" inset. Use with five #6 O.H. x 5/8" type screws. 2-3/4"L x 2"W x 1/8"H.
Tested for durability in conditions exceeding all KCMA certification requirements and BHMS standards for cycle life, strength and finish quality. Reliable, self-closing power of dual compression springs. Use (2) #6 O.H. x 5/8" type and (3) #6 F.H. x 1/2" type screws. 2.75"L x 1.875"W x .625"H. 3/8" inset. Use with five #6 O.H. x 5/8" type screws. 2-3/4"L x 2"W x 1/8"H. Tested for durability in conditions exceeding all KCMA certification requirements and BHMS standards for cycle life, strength and finish quality. Reliable, self-closing power of dual compression springs. Use (2) #6 O.H. x 5/8" type and (3) #6 F.H. x 1/2" type screws. 2.75"L x 1.875"W x .625"H.
3/8" inset. Use with five #6 O.H. x 5/8" type screws. 2-3/4"L x 2"W x 1/8"H. Tested for durability in conditions exceeding all KCMA certification requirements and BHMS standards for cycle life, strength and finish quality. Reliable, self-closing power of dual compression springs. Use (2) #6 O.H. x 5/8" type and (3) #6 F.H. x 1/2" type screws. 2.75"L x 1.875"W x .625"H. Tested for durability in conditions exceeding all KCMA certification requirements and BHMS standards for cycle life, strength and finish quality. Reliable, self-closing power of dual compression springs. Use (2) #6 O.H. x 5/8" type and (3) #6 F.H. x 1/2" type screws. 2.75"L x 1.875"W x .625"H.
Amerock Cabinet Hinge, Self-Closing, Imperial, 5 Holes, 2-3/4 in Door Leaf Length, 2 in Door Leaf Width, Face Mounting, Steel, Polished Chrome, BHMS Approved, KCMA Certified, With 3/8 in Inset Tested for durability in conditions exceeding all KCMA certification requirements and BHMS standards for cycle life, strength and finish quality. Reliable, self-closing power of dual compression springs. Use (2) #5 O.H. x 5/8" and (3) #5 F.H. x 1/2" screws. 2-3/4"L x 2"W x 3/4"H. Tested for durability in conditions exceeding all KCMA certification requirements and BHMS standards for cycle life, strength and finish quality. Reliable, self-closing power of dual compression springs. Use (2) #5 O.H. x 5/8" and (3) #5 F.H. x 1/2" screws. 2-3/4"L x 2"W x 3/4"H.
3/8" inset. Use with five #6 O.H. x 5/8" type screws. 2-3/4"L x 2"W x 1/8"H. Amerock Cabinet Hinge, Self-Closing, Imperial, 5 Holes, 2-3/4 in Door Leaf Length, 2 in Door Leaf Width, Face Mounting, Steel, Antique Brass, BHMS Approved, KCMA Certified, With 3/8 in Inset, 19.05 mm Projection Self closing 3/8" inset with 1/2" overlay. Screws included. 2 pieces. Amerock Cabinet Hinge, Self-Closing, Partial Wrap Around, 3 Holes, 2-1/4 in Door Leaf Length, 1-3/4 in Door Leaf Width, Steel, Burnished Brass, BHMS Approved, KCMA Certified, 1/2 in Overlay Tested for durability in conditions exceeding all KCMA certification requirements and BHMS standards for cycle life, strength and finish quality. Reliable, self-closing power of dual compression springs. Use (2) #5 O.H. x 5/8" and (3) #5 F.H. x 1/2" screws. 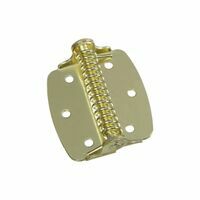 2-3/4"L x 2"W x 3/4"H. 3/8" inset with screws. 2 pieces. Amerock Cabinet Hinge, Self-Closing, Partial Wrap Around, 3 Holes, 2-1/4 in Door Leaf Length, 1-3/4 in Door Leaf Width, Face Mounting, Steel, Burnished Brass, With 3/8 in Inset, 19.05 mm Projection Amerock Cabinet Hinge, Self-Closing, 3 Holes, 2-3/4 in Door Leaf Length, 2 in Door Leaf Width, Face Mounting, Steel, Sterling Nickel, BHMS Approved, KCMA Certified, With 3/8 in Inset 3/8" inset with screws. 2 pieces.